People have historically married for many different reasons: legal, social, economic, spiritual, libidinal, and religious. So stop it with your ‘sacred institution’ argument and open up some history books. When you say that the Bible is clear about homosexuality, you must also admit that it was also very clear about how to treat your slaves, and the uncleanliness of women during their menstrual period. Listen. Society evolves. Sometimes we leave behind the Bronze Age mentality of the men who wrote the Bible. You want your marriage to be a religious, strictly bible-based marriage? That’s fine. Nobody is stopping you from having one. A very compelling read from a self-professed normal guy. I, a heterosexual, married, Georgia father of two, would like to think I could have written such a plain-spoken argument. The point Shepard is trying to make is it’s time for us to stop this nonsense of denying “other” couples that don’t meet our outdated, Puritanical notion of what a marriage should be the same rights, rewards, and responsibilities that heterosexual couples possess. As he states in his post, we are going to look back on this with the same shame we hold now when discussing civil rights and women’s suffrage. It’s ridiculous and it’s discriminatory. Plain and simple. I’m so sick of the “one man/one woman” argument, I could vomit. Stop it. Put your petty “the Bible says it’s a sin” argument to the side and get over it. Get over yourself, for that matter. Just because you don’t agree (or don’t even like it) doesn’t mean other people’s rights should be trampled on. It’s not a political issue. And it shouldn’t be a religious issue, either. It’s a human one. It’s time to start treating it that way. Puritans valued the family as the basic and permanent human institution. They permitted no divorce except for abandonment although they would allow an annulment because of infertility. They saw marriage as a civil rather than religious custom. Puritans arranged marriages for their children and no one could marry outside the church. A girl could veto a choice but no one expected her to use the right. Love meant physically caring for someone so romance was unnecessary for marriage. In spite of popular mythology, the Puritans respected a healthy sexuality and saw human sexual relationships as normal unless they became obsessive. They punished illegitimacy albeit gently. When a girl conceived out of wedlock, Puritans generally tried to establish a family. Pregnancies often resulted from the Puritans’ curious custom of “bundling.” Bundling allowed a courting couple to sleep together in the girl’s home provided they were individually bundled. While the Puritans appeared to take a loose position on fornication they severely punished adultery and they executed homosexuals. Never too old to learn something new! Thanks, Jay! How do right wingers who believe that government is incompetent, have complete faith that the same government never executes the innocent? 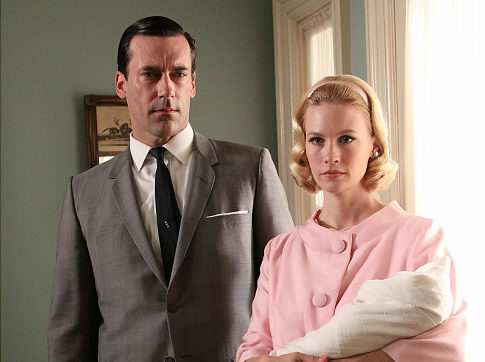 ‘Mad Men’ – with yet another Emmy the other night – is not about the nostalgic past and such lost pleasures as smoking. It’s about the unattainable future. Betty Draper is old now. She shops at Costco, buys the cheap beer and passes up Ivory for – what’s this? – Gain. A Mad Man would put it this way: Her Gain is our loss. An unbelievably well-written by piece by columnist Richard Cohen of the New York Daily News. Besides the maudlin mood of the piece itself, it is very poignant and disheartening. For what it’s worth, dad and I sometimes discuss the state of the country at our weekly dinners. The economic struggles. The constant political infighting. The ever-growing divide of the haves and have nots. It’s scary. I don’t know what to make of it. Dad doesn’t know what to make of it. It seems every time the very notion of true hope is presented, we (and I mean the collective we here) seem to squander it. I certainly felt it in 2008 when we turned our eyes to President Obama. Now, I don’t know where it’s gone. This is probably what is so disappointing to me about Obama’s presidency. It’s not him as an individual and it’s not the actions he’s taken as President. It’s the utter void where hope used to stand. For someone whose whole campaign revolved around hope, we sure have a dismal supply of it at the moment. As I listen to and/or read the “reviews” of Cam Newton’s first two games as a Carolina Panther, I just have to sigh and shake my head. That last one there is from an article posted on ESPN Sunday afternoon. I have to laugh and question all of these guys’ credentials. Did you not see any of last year when Cam was leading Auburn to a perfect 14-0 record en route to a National Championship. Did you not see the way he could take over a game by himself and literally carry his team (along with a couple of the other team’s defenders) on his broad back? If you didn’t, you weren’t paying attention. He has the arm strength and power of Dan Marino and John Elway combined. He is quicker than Michael Vick, faster than Michael Vick. And he will run over you with the power of a Jerome Bettis, Bo Jackson, Earl Campbell. That is the type of guy that he is. There isn’t another quarterback in the NFL that has all of those tangibles. One reason hopes were not as high may be the mess that got stirred up about midway through the season. There were allegations of a “pay for play” situation between Newton’s father and Mississippi State. Allegations that were never actually proven (to the best of my knowledge). But those allegations followed Newton through the rest of the season and not only gained his reputation, but the reputation of Auburn itself. And I’m quite no one was ever able to prove that Auburn participated in any sort of scandal. And, by the way, don’t you think it’s interesting that these allegations all of a sudden popped up when Auburn started the season 6-0 and Cam’s start was starting to rise? Hmmm. Anyway, the NFL is starting to see the talents that Cam Newton can bring to a football team. 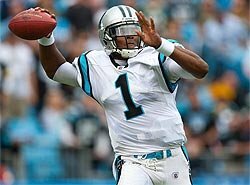 Yes, in the first two games in which he threw for over 400 yards, the Panthers also lost. Can’t deny that. But I’m almost positive that every Panther fan may be seeing their team’s future success every time that ball is snapped to number 1. They see it. I can’t believe not many others did. By the way, War Eagle! Extra Bonus Quote of the Day. By the time I feed my family, I have maybe $400,000 left over. That is Rep. John Fleming (R-LA), in an interview on MSNBC, on why as a small business owner he can’t afford a tax increase. You wanna know this difference in the rich and the non-rich, here’s your answer. By the way, make sure to watch the video. Priceless. Let me take you back in time about 5 years. It’s late 2006. There are lots and lots of rumors that Apple is in the process of making a phone. Nobody knew what it looked like and nobody knew how it worked. Obviously, this led to a multitude of theories and mockups that (mostly) proved to be completely wrong. At the time, I carried around my 5th generation white iPod (20GB) and a Motorola smartphone that ran Windows CE or Windows PocketPC or Windows Mobile or whatever the hell Windows naming scheme Microsoft was sporting back then for their mobile phones. An Apple fanboy even back then, I had my own speculation on Apple’s phone. I was intrigued from the very notion because it would mean that I would have the opportunity to only carry one device (phone + iPod) instead of the two distinct devices. Leave for work with device in hand. On the way to work, I can listen to my music and use it as my phone. I get to work and dock my device and it turns into my main system. After work, drive home (again, it serving as my iPod and phone). At home (once the kids are in bed), I plug it into my home dock and I have my main system again. All the while, my entire system/phone/iPod with me all the time. Keep in mind, this was also around the time people first started speculating about a tablet from Apple as well. (Wow, did those rumors take a long time to materialize!) There was even speculation that this tablet would slide into a dock and become your normal OS X system. I thought, wouldn’t it be cool if I didn’t have to carry around three devices (iPod, phone, and laptop) and only had to carry one device. One device to rule them all. (Sorry, had to do it.) Granted, I understood the technological hurdles at the time. No processor and memory combination was powerful enough and power efficient enough to warrant any discussion on that front. And the same thing could be said today. While the industry has come a long way since then, the power required to run (even) a mobile Intel processor is significant and not efficient enough to use for a truly mobile device. So, here we are 5 years later and what I am carrying around? 1 iPhone, 1 iPad, and 1 MacBook Air. Wow, we’re back to three devices. Of the three, my iPhone is, by far, the most important. It is always with me and serves so many different purposes. (I still have a blog post coming on this aspect, just haven’t gotten around to writing it yet). I use my iPad primarily as a reading/entertainment device (and kid pleaser) and my MacBook Air is used for all computing tasks not taken up by either of the other two. Now, we’re back to the same question. Wouldn’t it be nice if all of these functions could be done with just one device? I’ve come to face the fact that this may never happen. At least not any time soon. Phones are just too small to put any kind of power/battery combination that satisfies the efficiency demands of modern-day mobile needs. So, what about replacing the larger two? Apple’s answer to that question has been a firm “no”. Their fundamental philosophy is that each of these devices serve a specific and separate purpose. Period. No merging. No cross-pollinating. Nothing. They are separate and that’s how it is. Understandable. In practice, the use case of a laptop for “real” computing is very different than the use case for a mobile device (specifically referring to a tablet here). The main differentiator is touch. Touch, combined with the traditional desktop metaphor, has proven to be a sub-standard interaction technique. That’s why Apple decided to abandon the desktop metaphor in its tablet offering. 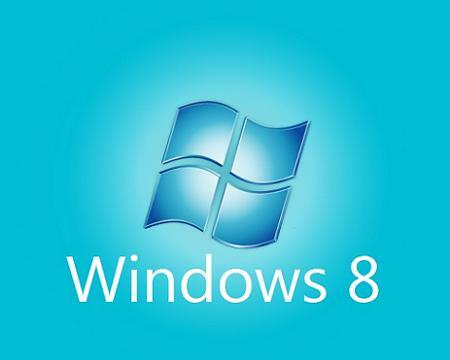 Microsoft, with their recently announced Windows 8 platform, believes differently. They have proposed to make one OS that will run not only on both hardware platforms, but (supposedly) at the same time. Want to use a tablet? Here’s the Metro UI for touch-y, feel-y use. Want to use the traditional Windows UI? No problem, here’s your desktop. Want to use the traditional Windows UI on a hardware tablet? We can do that ,too. Want to run Metro UI apps while you’re sitting at your desk? Wait for it…we can do that, too! Sounds a little pie-in-the-sky, doesn’t it? Since the announcement, there have been many things written about Windows 8 and Microsoft’s bold move into the tablet space. Some of them ridiculous. Some of them fanboy-ish. And some of them even thoughtful (perish the thought!). But, they all agree that it’s a bold and refreshing move from a company that has, for so long, relied on its two main products to carry the company (Windows and Office). As I always do, I Instapaper-ed (is that a verb yet?) all of these articles to gain some perspective from around the web. In this future world, you can use your device in many different ways. If you want to travel with a tablet but also need to run a Windows app, Microsoft will oblige: plug in a keyboard and mouse and your touchscreen tablet interface vanishes, replaced by old-school Windows. Carry a tablet with you for reading a book on the bus in the morning, then plug it in to a stand at the office and it becomes your PC. Maybe even something as small as your smartphone is actually your entire computer, docking to a tablet screen, TV set, or traditional desktop setup as needed. Microsoft is also counting on millions of PC users running Windows 8 on their desktop PCs and then demanding that same familiar interface on a tablet device. Sound familiar? Yeah, I thought so, too. What if they can do it? I mean, I’ll be as surprised as the next guy. I am cautious only because for the most part, Microsoft only sells software to businesses. I know, they make Windows, which comes on most (if not all) PCs you buy off the shelf. But let’s face it, consumers don’t buy PCs because they’re from Microsoft. They don’t actively go out and say, “Ooh, I’ve got to get a PC because it’s got Windows!”. They get PCs because they need a computer and they need it cheap. Hell, Apple doesn’t even make a Mac for under $600. Microsoft sells software to businesses (Exchange, Office, Server, Team Foundation Server, etc.). They know business. They get it. They cater to businesses with roadmaps, expectations, and notions of backwards compatibility going all the way back to the original (stone) tablet. Have you ever seen Apple lay out a roadmap for their products? Um, no. I’m cautious because I don’t know if Microsoft gets the consumer market the way Apple obviously seems to. But, let’s not sell them short for their idea. Windows 8 sounds a lot like what I say I want. Granted, they didn’t tie in the phone aspect, but I think that’s an engineering problem that can’t be solved right now. So, they didn’t get my full dream in there, but that’s not their fault. They have promised this mythical beast that can be your tablet when you want it to be a tablet and a PC when you want it be a PC. Can they do it? He’s got a good point. This mythical beast is not due out for another year. What will happen in the industry between now and then? One person on Twitter commented that by the time this thing comes out, we will (collectively) be talking about the notions of an iPad 4! Will Windows 8 and its feature set still be relevant by that time? Will Apple or even the Android tablet makers keep evolving to the point that makes Microsoft look like they’re chasing the tails of everyone else (again)? I don’t know what to make of it right this very minute. Too many things are up in the air. Too many questions and not enough physical hardware to see. Let’s face it, if it can’t run the traditional Windows UI on a mobile device, aren’t we just talking about the Metro UI as their mobile platform and Windows UI on laptops and desktops? if that’s the case, what’s the difference between that and what we have now with Windows (desktop version) and Windows Phone 7 devices? Nothing. Where’s the revolution? Where’s the sexiness in that? My overall point is I hope they do succeed in what they’ve proposed. It certainly is ambitious. And it’s the closest thing to device downsizing that I’ve seen. I’m always for carrying one less device. After all, that’s the main reason I bought the first iPhone!